Eco Synthetic Turf ProPutt 18mm grass is a very dense putting green. This is developed for both professional and amateur golfers. This grass is perfect for residential and commercial applications and can be used for sports areas and golf greens. See how simple it is to install. Watch this video. Need flags for your synthetic turf putting greens? We can also supply the flags and holes for your artificial lawn. Call us at 08 9407 7864. Why choose Eco Synthetic Grass for your putting green synthetic turfs? We looked at the finest golf greens in the world. We studied and worked hard to replicate them. It took us years of research and development until we ultimately created ProPutt. Our artificial lawn behaves like a golf green. It offers consistent speed (stint); but, unlike a golf green, it’s designed to last without all that maintenance. Now you can enjoy playing golf at the comfort of your backyard. 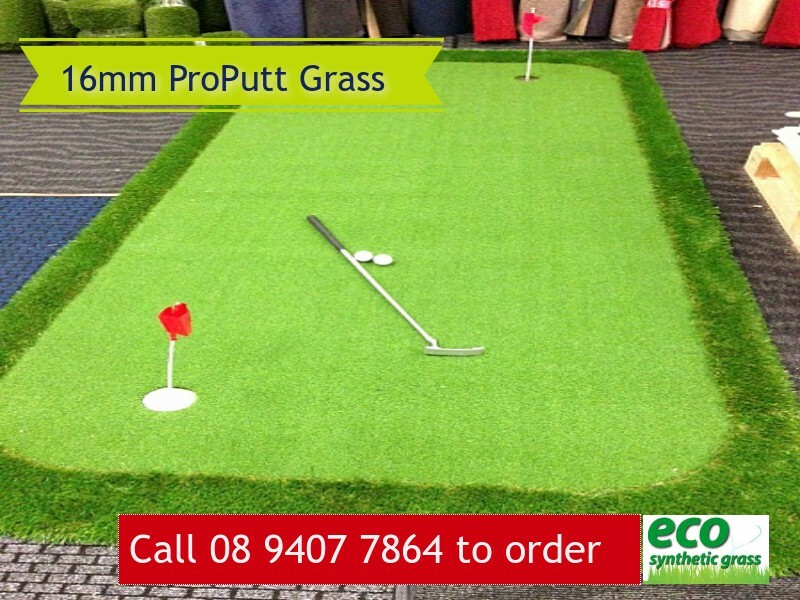 Impress your friends with your newly installed putting green using the Eco Synthetic Turf for putting greens.